I expected lightweight backpacking to be a hobby. Instead it has transformed me for the better. I am super grateful that my boyfriend got me into lightweight backpacking. We met while working and living in Yosemite National Park. He is an Eagle Scout, a former EMT and a gear nut, so I greatly value his opinion about all things first aid, backpacking, and wilderness survival. 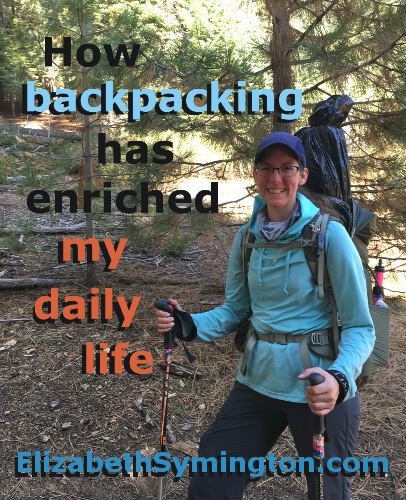 Tune in each day in October to learn how backpacking has enriched my daily life. To make it easier to follow this series, go ahead and bookmark this page now. And if you’d like to know more about me, specifically my love for motocamping and how I got into backpacking, here’s My Story. Day 2 – Is it Possible to Make Watermelon Jerky? Day 18 – Why is this Homemade Utensil Pouch My Pride and Joy? Elizabeth! Love this subject. As a fellow “gear head” as I’ve been called, I hope you will be talking about backpacking stoves. There are so many cool ones out there. The husband and I like to go out on off road rides and make a cup of tea in the wilderness with our little stoves. Hi Denise! Thanks for checking out my site. Thanks for the suggestion to talk about stoves. I will take that into consideration. I also love drinking tea. Typically I drink a tea pot a day and when I’m backpacking I like to pack a tea bag or two. It’s so peaceful sitting tea in nature. The perfect pairing. I am looking forward to what you share as I don’t know much about any kind of backpacking and how it could enrich your life. This is an intriguing topic. Pingback: Hey you. Yes, you. – What Do Wombats Dream? Thanks for dropping by and reading my series. I hope you found it helpful and interesting. I loved reading your posts. Your writing is so clever and funny. Have a great day!